Located in Singapore's busy Central Business District, Telok Ayer Park sits at the intersection of the Telok Ayer heritage district - once home to diverse communities and religions that lived near the historical coastline- and modern skyscrapers, a symbol of development and economic prowess of the country. It is also a culinary haven for the food-loving Singaporean, with nearby options ranging from upmarket restaurants to hawker fare at Amoy Street Food Centre which incidentally also houses four Bib Gourmand awardees by Michelin Guide Singapore 2016. With the shady canopy afforded by the mature trees, Telok Ayer Park offers great potential to be a community node for those who live, work, and play in the CBD. Yet, it is often treated as a place of transition by many, even during the busy lunch-time period. Why won’t people stay and use the park? What could be done to unlock the potential of this green space? What can a small park in the CBD be to its neighbourhood? In January 2017, we (Shophouse & Co) in consultation with National Parks Board (NParks), initiated a project to to turn this green space into a delightful and inclusive place for the local CBD neighbourhood. By utilising our very own Shophouse & Co Placemaking Method, we undertook a discovery phase to understand the place and the community around it. This informed a lunch-time prototype conducted on 22 February 2017 which enabled us to garner insightful feedback from the users. As part of Design Trails, Singapore Design Week 2017, we will be showcasing our explorations, and ideas to promote and enhance the enjoyment of our public spaces. We also invite you to join us in sessions with key stakeholders and practitioners in the placemaking discipline. Let's have a conversation about creating #placesforpeople! Come by to discover our research, insights and prototypes as we turn this green space into a delightful place for everyone who live, work, and play in the CBD! See documentation of our on-site observations, interviews, and prototypes. Experience some of our ideas in real-life and leave us your thoughts! Don’t forget to discover ideas by our design collaborators such as Lucky Charms, a comedic intervention by Natalie Kwee of Festive Folks, #TheLittleRedHop a paper installation and activity by Black Mongrels, and Park Life!, a sketch exploration by WYNK Collaborative. Come join us on Sunday, 12th March 2017! Meanwhile, here's some photos of our prototype that was held during lunchtime of 22 February 2017. How about we reimagine the lunch-time experience at the park? Bad Day? Get out and spend time at the park! Perhaps Telok Ayer Park as a pit-stop for delivery cyclists? Could we introduce some furnitures to make the park better? Fancy a light read after lunching on the swings? With our insights from the research, we approached a few of our designer friends to have a bit of fun and explore some possibilities. See what they came up with! Presented as a series of sketches, Parklife is a series of explorations into how we can improve user experience in our parks. From how a park begins as a manicured version of nature, we begin to ask ourselves questions to what would make it an even more enjoyable place for public use and activities. What ideas do we have to offer shelter while keeping the park open? How can we offer seating while not blocking the path? Could we design a visual marker for the park that can be more than just a signage? So many questions about life in the Park! Established 2011, Wynk Collaborative is a Singapore-based design studio whose work is centered around spatial design, and deals with all aspects surrounding it. Our process is rooted in the idea of collaboration and we believe in the power of good design to influence and create change. By looking beyond the confines of architecture, interiors and landscape, we create experiences that delight and touch the soul. Lucky Charms provides a spot of respite in within the CBD. Surrounded by high-stress corporate environments, the intervention aims to engage visitors with humour and optimism by giving them the opportunity to create their own luck. A series of “spots” will be marked out, some accompanied with instructions: good luck spot, stand here to increase happiness, increase your chance at love, etc. The comedic effect arises from individuals knowing the unprovable impact of their actions, yet unable to control themselves from engaging with the intervention “just in case”. Natalie’s background is a non-specialist mix of architect, designer, illustrator, consultant & entrepreneur. Her work explores the boundaries where these interests intersect, in order to create optimistic interventions that contribute to our overall enjoyment of life. This paper-installation hopes to encourage people to rediscover the nature and charm of the little spaces among our urbanscape. Visitors are also encouraged to fold their own 'Rabbit' and plant them across spaces where memories were once told. You never know what you will find when you follow #TheLittleRedHop to #seeyoursg! Just like the genetic make up of a typical mongrel whose ancestry flows from a diverse gene pool, Black Mongrels is a creative agency built upon the cornerstone of balance. It is our belief that when good design serves to solve and not to flaunt, true beauty blossoms and creativity thrives. This is a discipline of a high order, but one that we tirelessly abide by. Come join us in conversations about creating #placesforpeople with key stakeholders and practitioners in the field! 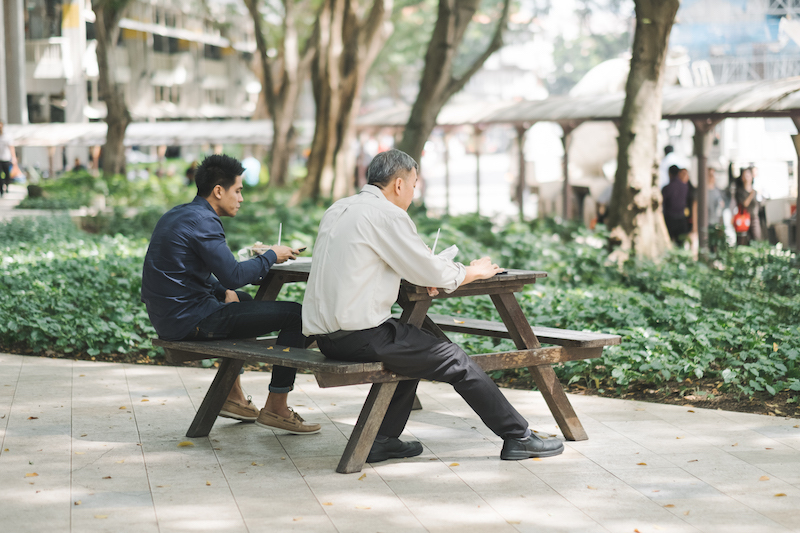 Join us for a lunchtime programme that will feature ideas to make the lunch time experience in Telok Ayer Park a more pleasant one! As you explore the various interventions around the park while enjoying lunch, listen to us and our collaborators about ideas and interventions for the park. To make your lunchtime experience a much more chilled-out affair, we will also have a breathing exercise session by Kadampa Meditation Centre, and a Virtual Reality Relaxation session by Hiverlab! Bring your lunch and come by with friends and family! We’ll have picnic mats and seats for you! Placemaking – Person, Event, or Process? The concept of “Placemaking” can be loosely described as the practice of creating vibrant places for people. It is a field that has been on the rise in the last decade, even influencing the recent New Urban Agenda published by UN Habitat in 2016. But what exactly is ‘placemaking’? Who is responsible of doing it and how does it work? What efforts are happening in Singapore and South East Asia? How effective have recent efforts been? What can we learn from each other? This sharing and panel session featuring practitioners from South East Asia, and Singapore city agencies hopes to shed light on the topic and catalyse conversations amongst the community. Mr Lai Quan Hui, Deputy Director, Placemaking Department, JTC. As an explorer of how urban spaces are used in the city, Shophouse & Co observes and then initiates conversations on future uses of both public and private spaces. With the convenience brought about by food-delivery services, a disruption is happening in not just what we eat, but also where we eat and with who. How can design of public spaces, interiors, and even delivery services contribute to communal dining? Could food delivery services expand the possibility of gathering over food in public spaces around the city? In this sharing and panel discussion, we invite creative practitioners who are actively leveraging on design, arts, and culture to create deeper connections between places and people. Expect explorations on the relationship between people and place such as concepts of identity, a sense of place, memory and heritage! Listen to the speakers share how they uncovered stories and memories, sparked conversations, and use creativity in catalysing new possibilities for heritage spaces.